Must admit my last few cakes gave me enough confidence to tackle the more complex of them ;) Pushing the envelope a little bit with every single cake. Devil's Food Cake? Yes! All of his cakes are chocolate. Hazelnut? Yes! Something nutty ... Fulfilled! And the cherry on top? Ferrero Rocher, of course! Cakes can be made 1 day ahead. Store airtight at room temperature. 1. Preheat oven to 350°. Coat the bottom and sides of cake pans with nonstick spray. Line bottom of pans with parchment-paper rounds; spray paper. 2. Sift cake flour, cocoa powder, baking soda, salt, and baking powder into a medium bowl; set aside. 3. Dissolve espresso powder in hot coffee in a medium bowl and whisk in buttermilk; set aside. 4. Using an electric mixer, beat sugar and butter in a large bowl until light and fluffy, about 5 minutes. 5. Add eggs one at a time, beating between additions and scraping down sides of bowl as needed. 6. Beat in egg yolk and vanilla. Beat on high speed until doubled in volume and very light and fluffy, about 3 minutes. 7. Scrape bottom of bowl well, making sure to incorporate all butter into eggs. 8. Beat for 1 minute longer. 9. With mixer on low speed, beat in flour mixture in 3 additions, alternating with coffee mixture in 2 additions, beginning and ending with dry ingredients. 10. With mixer running, drizzle in chocolate and mix until just blended. 11. Divide batter evenly among cake pans; smooth tops. 12. Bake cakes until a tester inserted into the center comes out clean, about 20 minutes. 13. Transfer to wire racks. Let cakes cool in pans for 30 minutes. 14. Invert cakes onto racks; peel off parchment and let cool completely. Hazelnut crunch can be made 4 hours ahead. Cover and chill. 15. Preheat oven to 350°. Line a rimmed baking sheet with parchment paper. 16. Spread out nuts on sheet. 17. Toast until fragrant, 6–7 minutes. Coarsely chop nuts; set aside. 18. Line same baking sheet with a fresh sheet of parchment paper; let cool. 19. Combine chocolate and butter in a medium heatproof bowl. 20. Set bowl over a large saucepan of simmering water. Heat mixture, stirring often, until melted and smooth. 21. Remove bowl from over saucepan. 22. Stir in hazelnuts and Nutella. Fold in toasted rice cereal. 23. Spread mixture out on prepared sheet; don't worry about spreading it evenly. 24. Freeze until set, about 30 minutes. Using your hands, break crunch into small pieces. Cake can be assembled 2 days ahead. Cover with a cake dome and keep chilled. Let stand at room temperature for 1 hour before serving. 25. Combine both chocolates and corn syrup in a medium bowl. 26. Bring cream just to a boil in a small saucepan; pour over chocolate mixture. 27. Stir until chocolate is melted and mixture is smooth. 28. Using an electric mixer, beat until cool, 5–6 minutes. 29. Add butter a few pieces at a time; beat until incorporated between additions. 30. Continue to beat mixture until thick and lightened in color, about 5 minutes in a stand mixer and up to 15 minutes with a handheld mixer (if mixture seems very thin, stop occasionally and chill in refrigerator to firm it up before continuing to beat). 31. 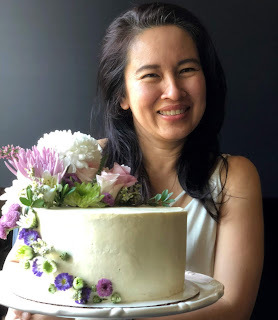 Using a serrated knife, cut off domed top from each cake to create even layers. 32. Place 1 cake layer on a large plate. Using an offset spatula, spread about 1 cup frosting on top of cake. 33. Sprinkle about 1/2 cup hazelnut crunch over frosting. 34. Place second cake layer on top; press to adhere (this will ensure that the frosting will hold the layers together). 35. Repeat process with another 1 cup frosting and 1/2 cup hazelnut crunch. 36. Top with third cake layer. 37. Spread remaining frosting over top and sides of cake. 38. Decorate top of cake with more hazelnut crunch, if desired. 39. Chill cake until frosting is set, 3–4 hours.